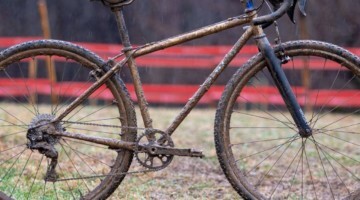 Before the start of the 2018 domestic cyclocross season, longtime team Clif Pro Team rider Maghalie Rochette broke with her team following a terminal diagnosis with CX Fever. 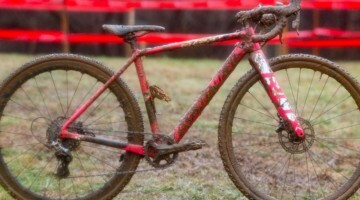 With her ’cross-related malady, Rochette left the Clif Pro Team and announced her new solo CX Fever program with Specialized and Ten Speed Hero to focus specifically on scratching her cyclocross itch. 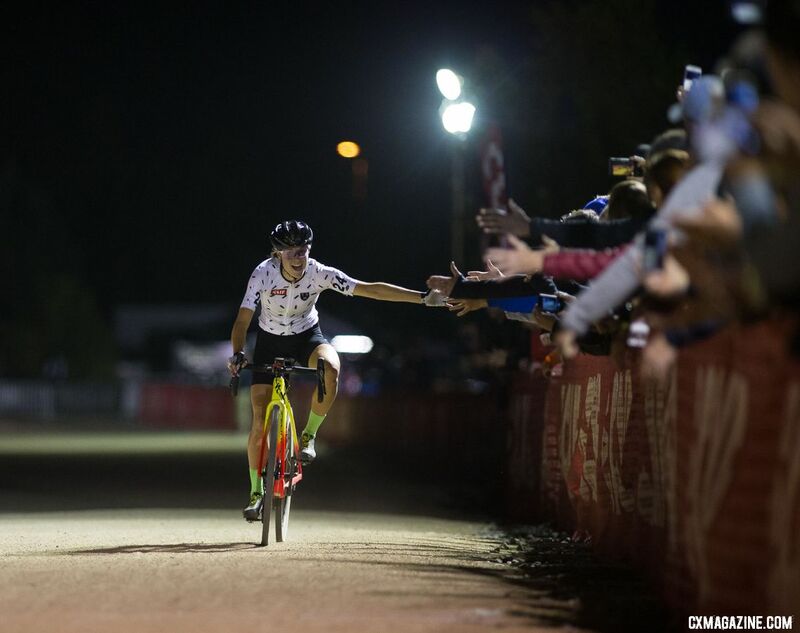 Rochette’s Fever flared at the inaugural edition of RenoCross as she ran away with a victory pretty much from the opening whistle. We profile her practically pandemic machine, shot in quarantine under the lights following her win. 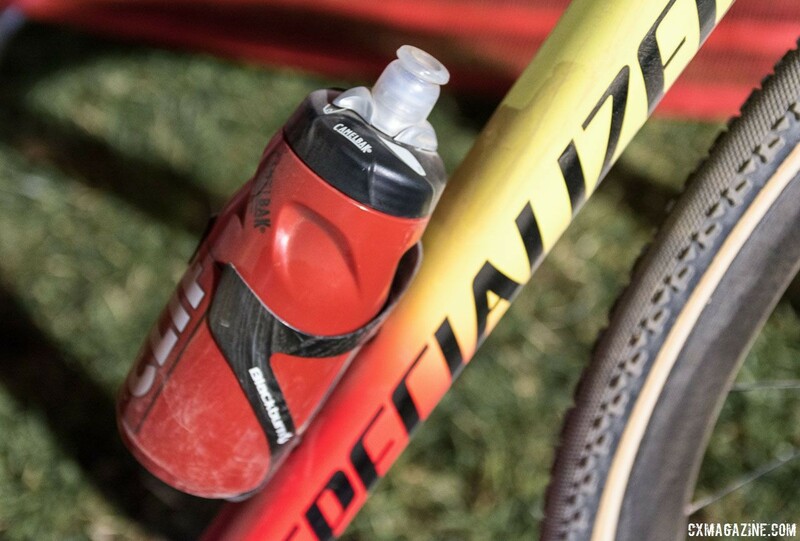 As a Specialized-sponsored program, Rochette is riding the CruX, the California brand’s dedicated cyclocross bike. 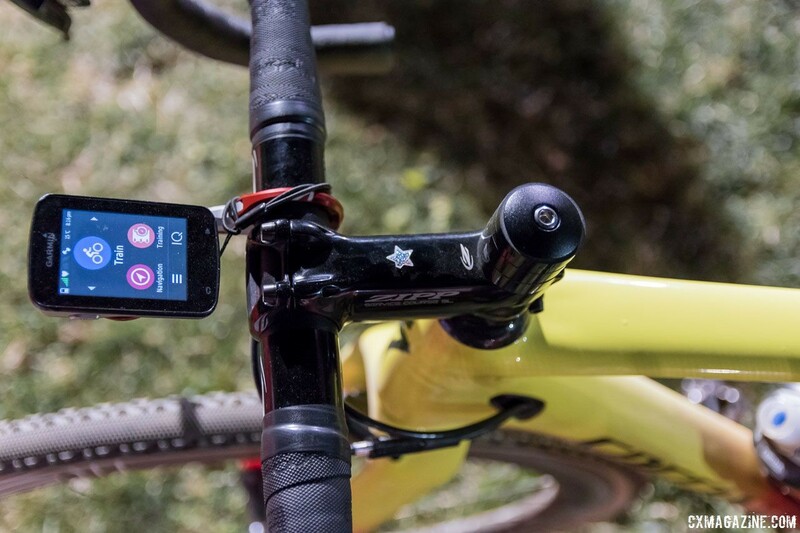 While we have seen other pros on the S-Works CruX, Rochette is riding the Expert available to consumers. 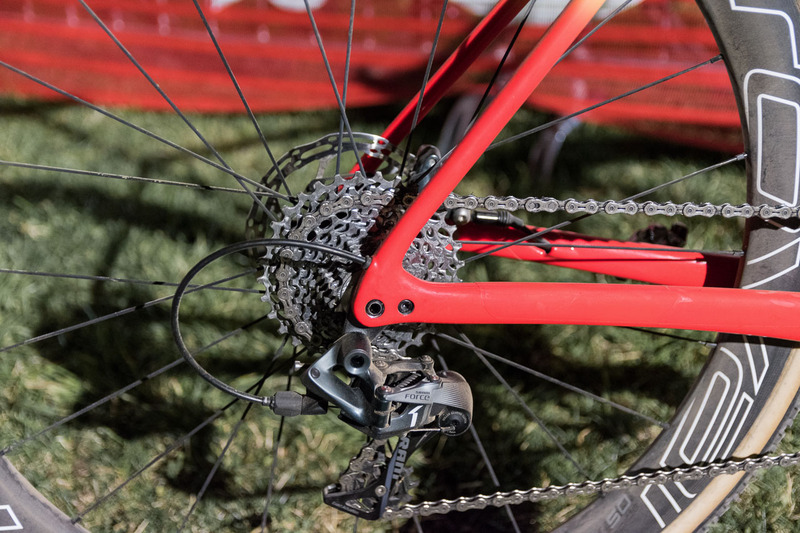 The heart of the bike is the same FACT 11r carbon frame as the S-Works build (which we recently reviewed) but dressed in a Force 1 build with hydraulic Force shifters, a clutch rear derailleur and the stock carbon crankset with a direct mount chainring from Praxis. 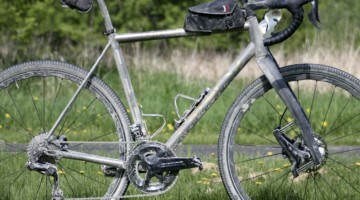 After RenoCross, Rochette swapped out the crankset and ring for a SRAM Force 1 setup. 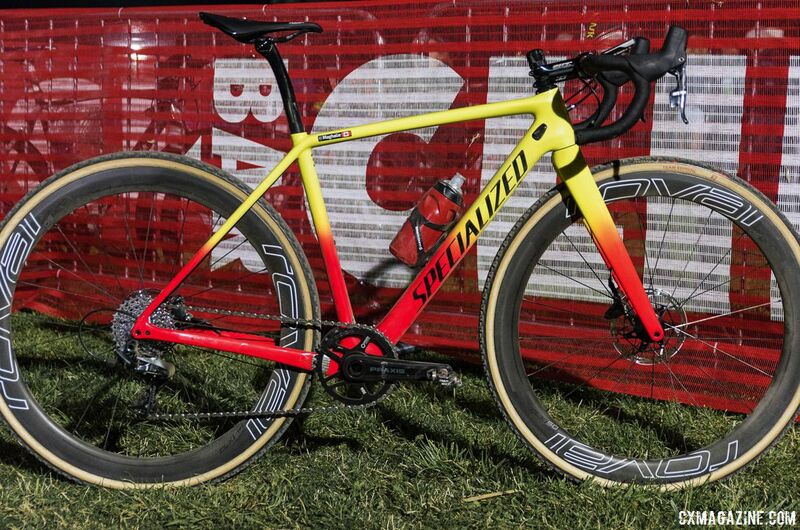 Rochette’s CruX features a red and yellow fade officially dubbed Team Yellow and Rocket Red that definitely stands out. 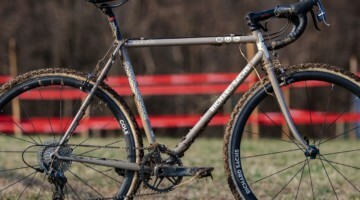 Rochette’s CruX does depart slightly from the stock build with Zipp Service Course SL bars and stem. Additionally, she equipped an S-Works Power saddle on the stock S-Works SL seatpost, a Blackburn bottle cage and Shimano XTR M9000 pedals. 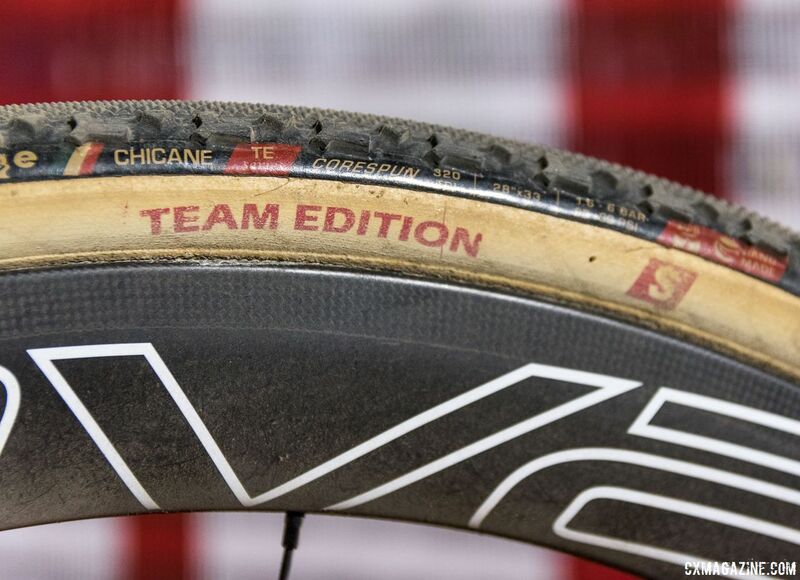 Rochette upgraded her rolling stock to Roval CLX 50 carbon tubulars with Team Edition Challenge Chicane file treads for the grassy course in Reno. The CLX 50 features DT Swiss 240 hub internals, Aerolite T-Head spokes, Ceramic Speed bearings and a 50mm carbon rim. Interestingly, although the tubeless clincher versions of the Roval CLX 50 wheels come stock on the S-Works CruX, the tubular version of the CLX 50 appears to not be available to the public yet. 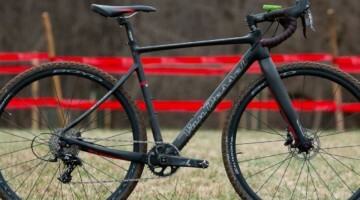 For more on Rochette’s RenoCross CruX, see the photo gallery and specs below.